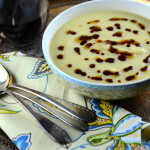 Super creamy cauliflower soup delicately flavored with saffron with a nice tangy contrast from the sumac oil. Sautée onion and garlic in olive oil on a soup pot, over medium heat, until onion is translucent, about 10 minutes. Add 5 cups of water, bring to a boil and simmer until cauliflower is tender, 20-25 minutes. Turn off heat. Add saffron, stir and cover. Let the saffron steep for about 20 minutes. Blend soup in a blender until creamy. Serve hot or warm with a drizzle of sumac oil (recipe follows).